The Census cuts non-religious people in half! The census data on religion produced by the 2001 census gave a wholly misleading picture of the religiosity of the UK, cutting the number of non-religious people in half. See What is happening. If you say you’re religious on the census and don’t really mean it, then you are treated by some sections of the media, churches, and even government policymakers as if you are a fully-fledged believer. 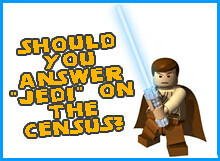 See why bad census data matters. The short answer is simple. If you’re not religious, then answer “No Religion” on the census. Take the pledge today! You can find out why this is our recommendation and there’s lots of other ways you can support the campaign. We need to raise awareness and we need to do it quickly. We are asking like-minded people to support advertising for the Census Campaign on public transport and in public places. Donate today. For a limited period: free campaign window stickers and posters for all! E-mail info[at]humanism.org.uk with your address and we will get them sent out to you asap.